I Won’t Look at it the Same! What I learned from class and what I’ve found most surprising. The most important idea I learned that changed my thinking and my way of observing social networking, is social networking can lurk in the most uncommon places. Try Amazon.com for example, its an online department store filled with social media components. The customer reviews and forums offer a community element to the site, where customers can interact, leave reviews and comments—create dialog, and vote about products. It really makes the shopping experience feel even more like I’m shopping with a friend. Another surprising find is my electric company, has a twitter page. Have a power outage or want to be notified of company-wide changes to electric bills? Follow Pepco on twitter. Yesterday my cousin left on a cross–country driving trip. Everything, from the app on her iphone that gives her fun facts about each state to her ability to log-in to Facebook and instantly converse with me about her experience cross country, uses a social media component. This class has truly equipped me for my future. 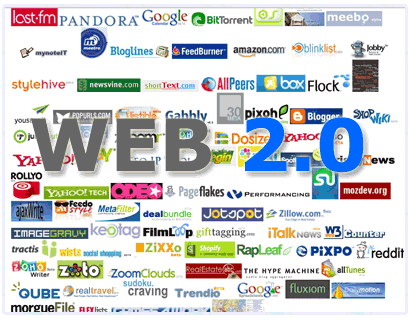 I am really surprised about the intelligence and imagination of the Web 2.0 landscape, and appreciate where its going. The Google class was a bit scary—imagine inadvertently providing satellite maps to terrorists byway the most powerful social media Giant. A tool everyone uses, if in the wrong hands could cause damage. Even though, Google Earth/maps is available to everyone, I am glad Google is on the good side! 1. Mashable.com	Good news/blog topics about everything social media. 2. Slideshare.com The largest slide sharing site on the web. Share presentations, portfolios, or webinars. 3. Checkplease	Users provide the dish on local restaurants. Videos, blog posts, and a chatroom (this one is for the Chicago area. Hope to visit a few places summer 2010). 4. Allrecipes.com	The blog page is filled with ideas and experiences related to my fav.—cooking and eating good food. Television competition series has used crowdsourcing—audience participation—for some time. Remembering Love Connection and Star Search, my generation has watched the evolution of television competition series—Who Wants to be a Millionaire, Dancing with the Stars and American Idol. Each show relying on audience voting—makes one person winner of one million dollars and recipient of major recording deals and fame. This time around, television networks have taken their crowdsourcing efforts to the internet! Lifetime television network is letting online voters choose Friday night’s 8:00 and 10:00 pm movie. Lifetime provides online clips of five contenders to visitors of the site; all users have to do is watch each clip (or two, or none) and “Pick–a–Flick.” This is very useful for Lifetime, because it gives its online and television viewers exactly what they want, a say in what they want to see on tv. My favorite television network’s online crowdsourcing example is Rate my Space. HGTV has created a community of hopeful makeover recipients, and loyal viewers of the Rate my Space show. To be apart of the community all you have to do is post pictures and/or videos of a space you desire to be made over, other online users rate the space, and each television episode HGTV devotes the show to professionally making over one of the lowest rated rooms. The site has received millions of picture uploads, therefore making passive viewers, loyal community activists. Its has devoted a blog, widget, facebook and twitter page to the show. One can even go online and rate the professional makeover. I for one enjoy reading all 345 comments about my space. Some increase dialogue with me and other viewers, some envision what I had in mind for my space, and some are just plain FUNNY! Will I ever make it on the show, who knows, but I like the other millions of hopefuls will keep watching the makeovers and rate other’s spaces.